The Strategic Plan: a tool for administrative power? that the explosive growth in administration, the decline in faculty influence, and the institutional corporatization of American universities contributes to a loss of intellectual rigor. The strategic plan serves several important purposes for administrators. First, when they organize a planning process and later trumpet their new strategic plan, senior administrators are signaling to the faculty, to the trustees, and to the general community that they are in charge. The plan is an assertion of leadership and a claim to control university resources and priorities. This function of planning helps to explain why new presidents and sometimes new deans usually develop new strategic plans. We would not expect newly elected presidents of the United States simply to affirm their predecessors’ inaugural addresses. In order to demonstrate leadership to the nation, they must present their own bold initiatives and vision for the future. For college leaders, the strategic plan serves this purpose. A second and related purpose served by planning is co-optation. A good deal of evidence suggests that the opportunity to participate in institutional decision-making processes affords many individuals enormous psychic gratification. For this reason, clever administrators see periodic consultation as a means of inducing employees to be more cooperative and to work harder. And it goes on. 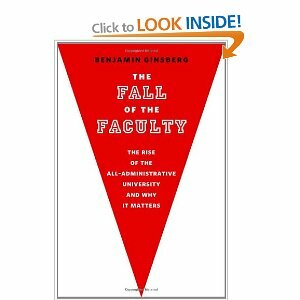 Essentially the argument is that not only is strategic planning a waste of time, it is also a tool for administrators to secure power and control over faculty. There are undoubtedly examples of where strategic planning is done poorly or undertaken insincerely or even cynically. And whilst it is always possible to over elaborate strategic planning, when properly executed it can be a key vehicle for achieving institutional change and improvement. The plan is not a blueprint for the future. It is, instead, a management tool for the present. The ubiquity of planning at America’s colleges and universities is another reflection and reinforcement of the continuing growth of administrative power. I’m not sure I’ll be buying the book.